My little one needed a new bag to use for dance and gymnastics. We had been using a cute little pink drawstring backpack she got at certain boutique run by fairy-godmothers-in-training but it has gone missing. After looking at the price to purchase a basic drawstring backpack I wondered if I could make one myself for less. I did a little internet research and behold, this is a very simple and inexpensive project. This project took me about 30 minutes. If you want to embroider, appliqué, or stencil words, a name, or a design on the backpack, this is the time to do it just because it will be easier to do it now than after the backpack is sewn together. One other note. I have put 21 photos in this tutorial because I do not apparently have the vocabulary I need to easily describe sewing techniques. Don't let the number of photos scare you off. This really is a very simple project. I am using one large rectangle for this tutorial which I cut from a half-yard piece. If you have an abundance of fat quarters (which I also have) use two fat quarters and cut two of the small 18"x14"rectangles. If you make two smaller rectangles, they do not need to match, just coordinate. Actually that would look really cool. I might need to try that next. If you are starting with two smaller rectangles, put them right sides together and sew them together along one of the short (14") sides using a 5/8" seam allowance. This seams is the bottom of the backpack so you may want to sew a second seam right next to the first seam you sewed to reinforce the bottom seam. Now you have one large rectangle of fabric. Press the seam. Fold the long sides of the fabric in at 1/4 inch and iron the fold in place. Stitch down the 1/4 inch fold on each long side. Now we are going to make the tube through which the cording runs through. At each short side of your fabric rectangle fold over about 1/2 inch of fabric and iron in place. Fold that same side over another inch and iron in place. Do this for both short sides. Stich the bottom of the tubes in place. The bottom of the tube is about an inch down from the edge of the fabric. For both tubes, stich close to this fold so that the tube you have ironed in place stays put. If that sentence made no since at all, look at this picture. Now fold the fabric in half, right sides together. Match up the tubes at the top. We are now going to stitch along each of the long sides of the folded fabric to make the side seams of the backpack. Start stitching about one inch from the bottom of the backpack. Yes this leaves a little hole in the side seam. Trust me, this will be important in a few minutes. Leave about a one inch gap at the bottom of the side seam. It will be sewn closed in a later step. End the side seam at the bottom of the tube. Don't sew the tubes closed. ﻿Make sure you reinforce the place you started and stopped stitching along the sides of the bag. Now we are going to run the cord through the tubes. Take one of the 2 yard cords and attach the large safety pin to one end. You are using the safety pin to push through the tubes (because it is so much easier to push the ridged pin through rather than try to feed the cord through the tubes). Thread the safety pin/cord through one tube, then run it back through the other tub so that it has essentially made a U-turn through both tubes. Remove the safety pin. Even up the ends of the cord and knot them together. Take the second 2-yard piece of cord and do the same thing you did above but starting from the opposite side. Now you have cord threaded through both tubes, one entering/exiting from the right and one entering/exiting from the left. Remember that little gap in the side seams we left, well this is where it becomes helpful. Leaving the backpack inside out, take the cord on the left and put it inside the backpack. Reach inside the backpack and push the knot you tied in the cord through the whole in the left side seam. Now do the same thing with the cord on the right and the gap in the right side seam. When you look at your inside out backpack, the cord knots are pushed through the side seams at the bottom corners. The last step is to sew shut the gap at the bottom of each side seam, sewing the cord in place at the same time. Reinforce this seem because it is going to take a lot of stress. Turn the backpack inside out and pull the cords to close it. See how simple that was. There you have it. Your basic drawstring backpack. Thanks for taking a look Marty! This is so cute, I absolutely need to make one of these for myself. And honestly, I am a visual learner and prefer lots of photo tutorials rather than lengthy instructions. Plus photos are way more fun to look at. Thanks for sharing, this project looks very approachable! It really was so much easier than I thought it would be. Next time I do a tutorial though I think I need to pick a less vivid color. I get dizzy looking at all the polka dots! Thanks for stopping buy. I love it! I was thinking about how to get daypacks for my Daisies and Brownies. This is a simple project we could do with the girls at a meeting with the adults handling the sewing machine. I was thinking that this project is going to come back to me in a similar way. We are just starting up our Daisies next month. Have fun with this and thanks for stopping by! Super cute! Thank you for sharing with the Clever Chicks Blog Hop! Love, love, love sewing! And this is so adorable! These are great when the kids are going on a field trip. They can just tuck their sack lunch and other necessities in there and keeping stepping. Love it! This is a wonderful tutorial, I have pinned it for future reference! Thank you so much for sharing on Meandering Mondays! Have a great week! I just finished making one of these for my daughter's friend. I searched the web for a tutorial and your was the easiest to follow and had very helpful pictures! Now I'm making some for my own kids and myself! Thanks! Hi Sharon. I am so glad this tutorial was helpful! I tried to put the directions into words first and realized I really needed to use lots of pictures because, while it is easy to make, it is hard to describe. Thank you for leaving my a note. You made my day! This is amazing!! I just made one of these as a party favor for my sons birthday party Saturday and I cannot wait to make another! This was so easy and helpful. Thank you so much! Recently, I bought a super cool and stylish Kate Spade backpack from a local fashion outlet. I got thousands of compliments for this bag. So, what does that have to do with the wonderful tutorial that was graciously shared with us? Brag to your friends through Facebook, this post was to share with others that are like minded enough to care about creating something unique. Thanks for this photo rich tutorial. I'm a visual learner and this was really helpful. I just made one for my 3 yo grandson and am going to help my granddaughters 5,6,and 8 make one for their summer fundays spent with grandpa and me. Again thanks for sharing. This was my first sewing project, and I really appreciated all of the photos! I ended up using Wonder Under to put on a decal of my sorority's hand sign, and it looks too cute! What a simple way to do the strings at the bottom of the bag! I agree with others that this is by far the simplest and easiest tutorial to follow! Thanks! I have been looking for an easy peasy drawstring backpack,,You are a godsend to me!!! With ten grandchildren, seven of them local, there is only one grandson among six granddtrs..I made the girls little drawstring bags with shorter pulls,,ribbon, cording etc. This is a great project to make for him..Thanks sew much! This is a great tutorial. My 10 year old son just made a camo bag for his friend. Now he's planning a bigger one for his brother. FYI: If the person using this is bigger than an 8 year old you might want to add an inch or two all the way around, depending on what they might want to carry. Thanks for this tutorial, it was the easiest to understand. This size was just what my 26 yr old daughter was looking for. So glad I kept searching. Other tutorials had me sewing all the way down, then picking out stitches to slide the knots through. Seems so counter intuitive! Great photos - they helped a lot! Going to make this with my Brownie troop as a first sewing project. Thanks for all the pics! 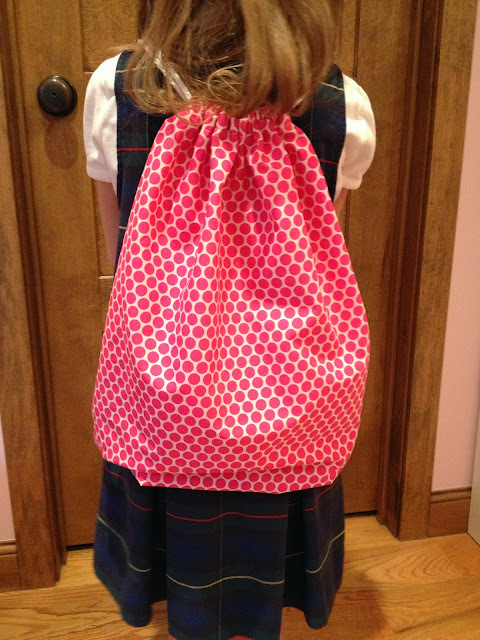 I'm taking your wonderful pattern to create Post-op backpacks to send overseas to third world countries. Thanks for the inspiration! Thanks for all the photos. They mad the bag super easy to make! I love this tutorial. How simple would it be for me to add another fabric as a lining?